After reading Kim Werker’s most recent blog post… I’m officially inspired to run things a little differently on my new little blog. Check out her post on Crocheting blogs. www.kimwerker.com. I have felt myself limiting my posts to updates on the LYS’ I’ve visited. But… it seems that didn’t excited me as much as visiting the yarn stores themselves did. From here on out, I’m going to write more often, and write about thing that are exciting me or pushing me to look for new answers. pattern I’ll be writing as soon as I sit myself down and actually write. And… this shrug was just for fun. I found this yarn for sale at Yarns 2 Ewe in Houston. www.Yarns2Ewe.com It’s so soft with gold flecks. 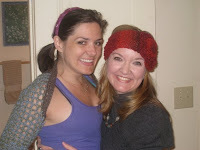 The cutie in the red headband is my good friend Melissa who just moved to Huntington, Indiana. I’m following your blog!! You should follow mine! Love you! !